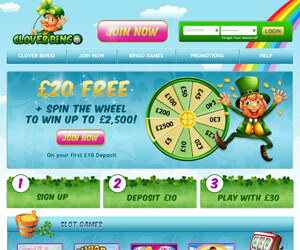 Clover Bingo | Get £20 FREE + Spin The Wheel! 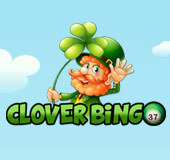 Clover Bingo is the new and improved Paddy Bingo and has hit the bingo scene with a spectacular lucky Irish theme. The bingo games are fantastic, the promos are amazing and the cash prizes are absolutely sensational. The fun begins when you sign up and grab your 200% first deposit bonus after making your first deposit of just £10. What's more? After you sign up you'll get a chance to spin the wheel for the chance to win £5 – £2500 absolutely guaranteed! Clover Bingo features a fabulous selection of 90-ball bingo and 75-ball bingo games. There's also a tremendous selection of free bingo games, jackpot and progressive jackpot games. Additionally, Clover Bingo hosts plenty of top online slot games for players to choose from. All of the most-loved online slot games are available at Clover Bingo with top titles such as Fluffy Favourites, Sugar Train Slots, Doctor Love, Irish Luck and more! All Clover Bingo players can earn their way into the Clover Bingo VIP club by accruing loyalty points. Once you're a Clover Bingo VIP you'll have access to incredible exclusive rewards, members only promos, birthday bonuses and other extraordinary promotions. The VIP scale is ranked from Bronze, Silver and Gold all the way up to the coveted Black level VIP with 75% re-deposit bonuses and 7% monthly cashbacks! Clover Bingo is packed with all sorts of incredible promotions. Some of these promos include a first deposit bonus with a FREE £20, Monday Madness with prizes for 1 liners and full houses, Fun In The Sun where players can win passes to top attractions and theme parks, Lucky Lotto with only three numbers needed to win, Weekend Wad where you can win a whopping 250,000 points and loads more! Clover Bingo lets you play with a team of friends so that you can all work together to win massive piles of Clover Bingo Loyalty Points. Also, be sure to play on Clover Bingo's Jackpot Games for the best opportunities to win mega amounts of cash. Keep an eye out for the monthly jackpot game that plays on the last day of every month for big money winning prospects!